You can’t have failed to notice the green and purple goodness that is Day of the Tentacle Remastered, currently sitting pretty in January’s PlayStation Plus games right now. If you’ve not yet tried the classic ‘point and click’ adventure title, then consider a stern look of disappointment shot in your direction. Go! Download it now and redeem yourself. 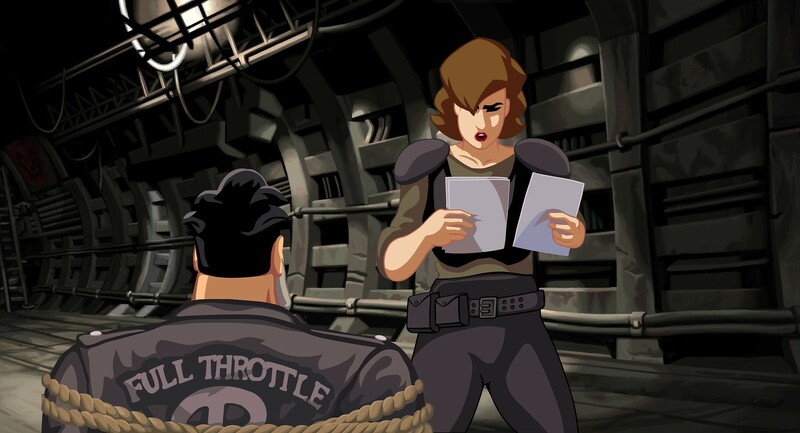 For the rest of us who appreciate the shiny work of Double Fine (and previously LucasArts), no doubt you’re all revved up for Full Throttle Remastered coming to both PlayStation 4 and PlayStation Vita later this year. And you’re not alone – Double Fine’s Founder is champing at the bit to get heavy metal biker Ben back on the saddle, ready to blaze a new trail of 21st century glory, since its 1995 debut. 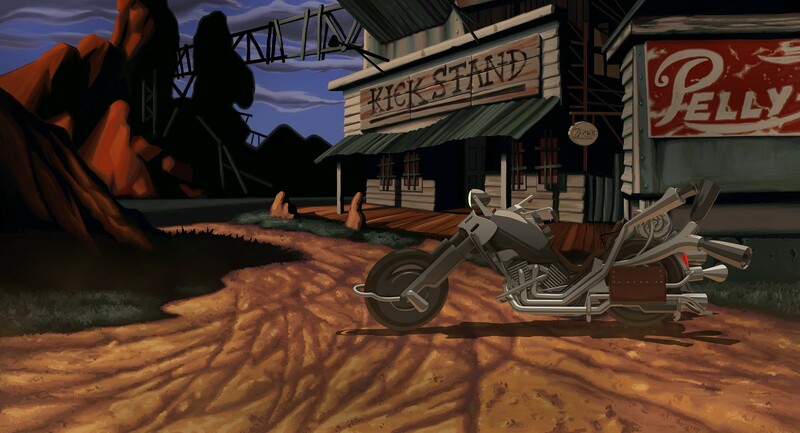 As with Day of the Tentacle, Grim Fandango and the Monkey Island games, Full Throttle Remastered is getting a massive blast of restoration goodies. All new artwork, 3D high resolution backgrounds and animation, improved and uncompressed sound effects and music, a concept art browser and commentary track featuring the game’s original creators. “That part was especially fun,” says Tim. “Getting some of development team back together for the commentary – we’re all hearing stories about the game I’ve never heard before which is great, as is remembering what we were actually trying to do with the game at the time. While this visual flair which has led to Full Throttle possessing a wonderfully distinctive art style that has only been enhanced with its remastering, it’s come with challenges that are pretty much unique to the Remastered titles to date. Gamers from the 90s will likely remember LucasArts game Star Wars: Rebel Assault, which was developed alongside an animation engine called INSANE (INteractive Streaming ANimation Engine). The intention was to allow compressed full motion video within games – meaning photorealistic visuals could be used in-game, which was relatively rare at the time. “In the Mine Road sequence of Full Throttle, we used the streaming INSANE engine from Rebel Assault so that the road was constantly coming at you as a pre-rendered movie,” explains Tim. But aside the repainting of most of the game to keep it up to speed with its contemporaries, it’s very clear Tim is still very happy that Full Throttle is coming back. 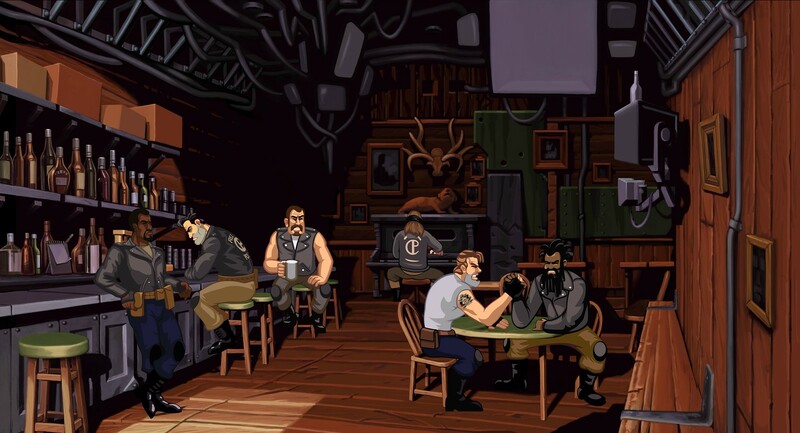 Especially with its memorable blend of colourful characters – although he recommends staying out of biker bars that may have any similarities to the game.